In this post, we continue to use photos of our church design and building projects to highlight recent church building trends. This time, we look at one that has stood the test of time, perhaps in part because it connects with other church design trends that we have already discussed. Indoor playlands first became a popular addition to many a church design back in the 1990s. Some church leaders—and even some of our church building leadership here at The McKnight Group—thought that this would be a passing fad. However, we are still incorporating a lot of children’s playlands into our church designs. Certainly families with children love a church that includes a place where kids can run around with each other and have a good laugh. 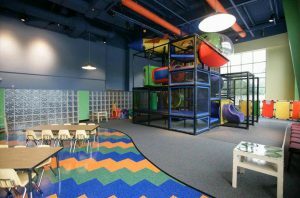 We think this enduring popularity might also be because of the connection between indoor play areas and third place design. When parents know there’s a safe, indoor play area in the community, they are very likely to make use of it, especially in bad weather. 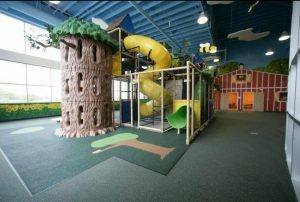 This first photo is of the indoor play area at Westerville Christian Church in Westerville, Ohio. This play space may look large, but it’s actually a relatively small playland. In this case, size doesn’t matter that much. The church gets an unbelievable amount of traffic here—as many as two thousand people came through this space in the first year after it was completed. Part of the reason it’s so popular is that the church rents it out on weekends for children’s birthday parties. This means that families all through the community bring their children to this playland—and come to think of the church as a warm and welcoming place. This second photo is of a playland we built in Overland Park, Kansas. It is a much larger playland that’s clearly designed with a farmland theme. The space is bright and has a couple of unique features, including a giant tree to climb and multi-use spaces inside the “barn” doors that can be utilized for classes, art projects, or ice cream and cake time for children’s birthday parties. Birthday parties are not the only reason that children visit indoor play areas. The principle behind third place church design is that people want a third place to hang out besides home and work or school. Gateway Church of the Nazarene, Oskaloosa, IA has provided that with its indoor playland. The church did it by simply putting the playland next to a café (another of those church building trends) in its church design. 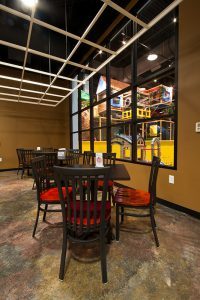 This playland and café are open during the week, so that kids have a place to play while their parents can have coffee and conversation in the adjacent café. As you can see, many church building trends are interconnected. Because all we do is we design and build churches, we can see these connections and help you think through them when you’re planning a new church building or the remodeling of an existing church design. To keep up with all the latest church building trends, sign up today for our free i3 webinars.